We all face problems and challenges in our lives, and often they get better with time. Sometimes, though, difficulties seem to stick around for longer than we would like, or seem to affect us more than other people. CBT has a lot to say about why some problems stay ‘stuck’ and often don’t get better by themselves. More than that, it is a helpful way of thinking about what we might need to do to get ‘unstuck’. All of our actions have consequences. Some are intended, and some are unintended. For example, if we buy ourselves junk food as a treat we might enjoy it while we eat it (intended consequence) but then feel guilty about our waistline afterwards (unintended consequence). Can you see how her best effort to cope let to harmful consequences? In CBT terminology, anything that keeps a problem stuck is called a ‘maintaining factor’. Here are some common maintaining factors. Notice whether you do any of these. There are too many consequences of avoidance to list here, but chances are that if you avoid something your actions have a consequence. 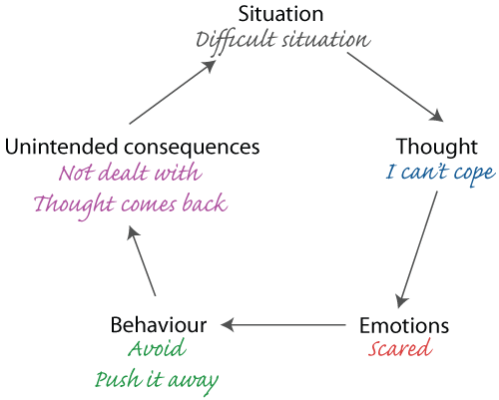 Safety behaviours are a specific form of avoidance, and are sometimes referred to as ‘subtle avoidance’. A safety behaviour is something that we do to prevent what we fear would be a catastrophe. For example, someone who is nervous around other people may speak quickly in a meeting (i.e. avoid speaking normally) to prevent the ‘catastrophe’ of embarrassing themselves in front of a group. Someone else might be very careful to avoid raising their heart rate to avoid the feared catastrophe of damaging their heart. Like avoidance, safety behaviours always come with consequences, both intended and unintended. If things aren’t going well for us it is normal to think about what is going wrong. Thinking and planning is a uniquely human ability and it can be tremendously powerful: used properly it can help us to to achieve great things. However, when we are depressed or anxious the way that we think can change, and we often start to think in unhelpful ways. We often ask ourselves two types of questions: “What … ?” questions, and “Why … ?” questions. “Why…?” questions are more dangerous. Used in the right amount they can help us to work out why something went wrong (e.g. “Why did this accident happen?”). And they are helpful if we follow them up with a “What…?” question to solve a problem (e.g. “What can we do to prevent it from happening again?”). If we use “Why…?” questions exclusively, or too much (e..g “Why am I like this?”, “Why do things always go wrong for me?”) then we can end up feeling hopeless, stuck, or depressed. Begin to notice what kind of ruminative questions you are asking yourself. To a limited extent, some self-criticism might be motivating. We might say to ourselves “come on, you can do better” to encourage ourselves. However, self-criticism can be incredibly damaging if we put ourselves down too often, or if we use it too much. At its extreme, self-criticism can be disabling – it is almost as though part of you is bullying the other part. Our bodies and minds respond to this self-criticism as they do to other threats, often by becoming overwhelmed, more distressed, or functioning worse. This is one way self-criticism can be self-defeating. Selective attention means paying attention to one area and neglecting others. For example, someone who is afraid of sharks will notice newspaper reports about shark attacks but may completely fail to see millions of people swimming safely in the sea every day. Our concerns, fears, and worries shape what we pay attention to, and this can very quickly bias our view of the world.